Dill is, we think, one of the great herbs, and is sadly underappreciated and underused in the U.S. Dill is grown for both its dried seeds and its ferny leaf; though the same plant can be used for both purposes, cultivars aimed at one or the other particular use have been bred, so one is best off using different plants, of different cultivars, for the two purposes. This page deals only with growing dill for leaf (commonly called “dill weed"). 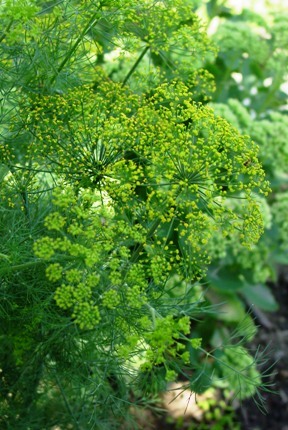 Dill cultivars (like those of coriander) fall into two broad classes, those intended mainly for seed production and “slow-bolt“ types intended mainly for leaf production; there are also some varieties that are distinctly smaller than the others, intended especially for container growing. Dill is an annual. In its early growth, which typically lasts 40 to 60 days after emergence, it produces the ferny leaves (“weed“) that we want. At some point, the plant starts sending up a flower stalk from its center, at which time leaf production ceases (and seed production begins). Obviously, then, we need to start a new plant every couple of months or so to be assured of a continuing supply of fresh dill weed. As with most herbs, dill definitely wants well-drained soil. It likes full sun. To sow, place the seed on the soil surface, then just barely cover it with sifted soil or a little sand. After sowing, be patient, for dill is a slow germinator, often taking over 3 weeks to emerge, though rather less if the soil is warm (as it should be indoors). Fertilize growing dill when the plants start flowering with a sprinkling of fertilizer high in potassium and phosphorus. Keep an eye on your dill plants—which, of the non-dwarf varieties, can get tall, 2 to 3 feet high if healthy—to see if they’re starting to droop from being top-heavy; if so, stake them. You loaded this page on Friday, 19 April 2019, at 17:10 EDT. It was last modified on Monday, 4 February 2019, at 02:57 EST.